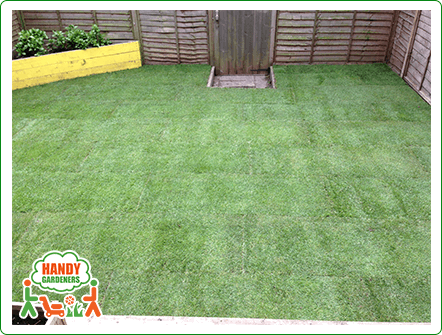 The lawn turfing you get from us will make your lawn look amazing. You will be pleased with the results our gardeners will deliver. They will literally breathe new life to your garden. This will be witnessed by everybody you invite in and they will be amazed by the great care you put in your garden. The great staff we will employ for the job will make sure that you get the absolute best lawn. The job was completed within 7-8 hours by 2 gardeners. The price was calculated based on the sq.m provided by the client over the phone. Here you can see the area before the job started. Planting a new lawn is a big job and it requires a few steps. Before starting, however, the new turf should be laid within 24 to 48 hours of delivery, which means that the preparation work should be carried out in advance of the turf arriving. 1. 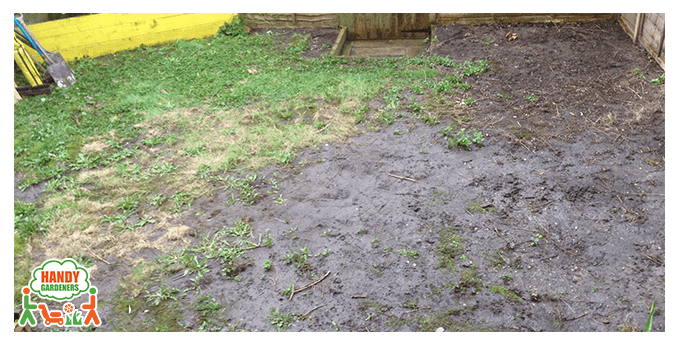 The first step is to remove poor - quality turf, which you can accomplish in several ways. 2. Preparing the soil - Soil needed to be turned over to a depth of 15cm. This was achieved by using a rotavator. 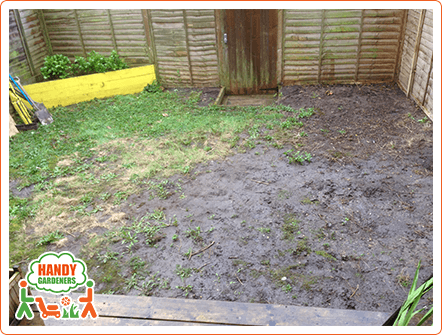 Our team checked and ensured that the area was free of any debris, stones, weeds, or old turf. 3. Raking - The ground should be raked over to produce a smooth surface. 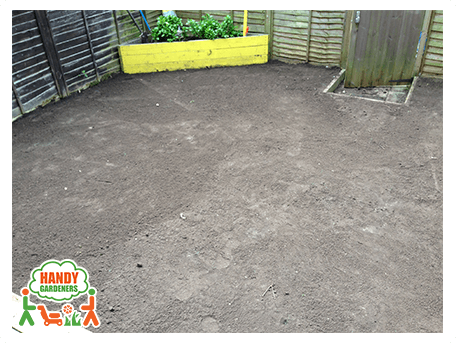 At this stage the ground may be lightly rolled or firmed by foot to reveal any soft areas which then can be raked levelly. This process should be carried out until the ground is evenly firm and smooth. A wide rake makes levelling easier. The ground should be firm but not compact. 4. Fertiliser - A pre-turfing fertiliser was applied over the soil. 5. Laying the turf – Our team started by laying the first row along the longest straight line and worked across the area rotating the joints in each row – just as with brickwork. 6. Watering the turf - Newly laid turf must be watered within half an hour of installation. Once the team finished with laying the turf, they watered it in order to check whether the water had seeped through the turf and into the soil below. 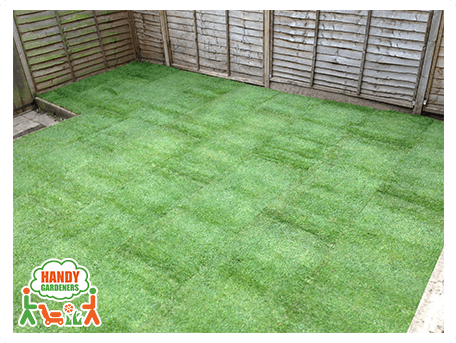 They advised the client that watering must be repeated until the turf is established. Do not mow your new lawn until it has rooted. This can be easily checked by lifting a corner of the turf to see if the roots have attached to the soil. Mow your new lawn often, each time removing a third of the grass height. Once established, the grass height can be reduced gradually to the desired level. Feeding during the first 6 weeks will not be required as you have used a pre-turfing fertiliser.